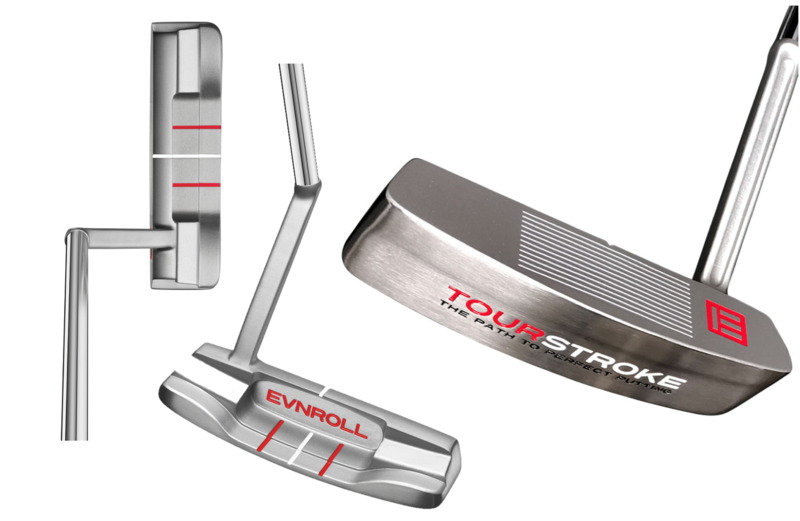 Evnroll have announced the extension of its putter range with the launch of four new putter models, in addition to a new Tourstroke Trainer and Gravity Grip. Evnroll Putters first came to the golfing world’s attention in 2016 with a range of 100% milled putters featuring Guerin Rife’s patented ‘Sweet Face’ Technology, a unique milling pattern engineered to deliver uniform performance across the entire hitting area of the putter face for unprecedented accuracy and zero dispersion. The new ER1TS is actually a CNC-milled version of Rife’s new TourStroke Trainer, with the key feature being the degree of offset. Head shape and style are the same as on the original ER1 heel-toe weighted flange blade, but with the addition of a hosel that moves the shaft one inch in front of the face to create an super stable “effective” MOI of 20,000. This design creates forward press and sets the right wrist without leaning the shaft forward to promote a very stable one-piece shoulder based putting stroke. ER2.2 is a new plumber-neck version of the popular ER2 MidBlade model, with the heel-side mass reduced to allow for the extra weight of the hosel arm to keep the sweet spot in front of the center sightline. The ER8.3 is a flow-neck Players MidMallet, which Rife is hailing as the prettiest putter he’s ever designed and one that will be finding its way into his bag. There is no single perfect way to putt, but the common stroke path most tour players set out to achieve is slightly shorter on the takeaway, square at impact and just beyond, and then slightly longer and back inside on the follow-through. The TourStroke’s elongated hosel, which angles 1¼” forward of the face, is designed to instantly create this stroke path when used in the training mode. In the training mode, the putter face should be positioned about 1” behind the ball. This promotes the three fundamentals of ‘proper putting’ highlighted above – shorter takeaway, square through impact, longer follow-through – allowing even complete beginners to instantly make the perfect stroke path. The secret to the TourStroke’s performance is that the golfer knows the head is not in line with the shaft so will instinctively keep the face square until it contacts the ball to avoid pulling the putt. By keeping the shaft moving through the impact zone, the golfer will also automatically have a longer follow-through. Best of all is that the TourStroke’s effective MOI is 20,000 because the entire head is positioned 1¼” from the ball – a level of stability previously unheard of. This new, deep V-shaped grip incorporates an ultra-light 35 gram EVA foam body with a 70 gram 9” steel rod that runs the length of its extreme lower section. Moving twice the grip’s structure weight directly below and ½” away from the shaft allows the hands to feel and maintain a square putter face through the entire hitting area, virtually eliminating face rotation at impact. Adding the 15g outer wrap the Gravity Grip has a total weight of an above average 120g. This allows for more weight in the putter head to generate a greater overall weight for increased stability and accuracy, while maintaining an ideal swing weight for optimum feel and distance control.